Good one Robie. I just showed that to my wife and said "look at the one I let go". She's not very pc savy and knows nothing of photoshopping and was duly amazed at the size of the one I let go, ha. The Sharkathon tourney on PINS you have to show your shark beside an approved ruler, as it's a catch and release tourney. You would not believe the size of some of the sharks caught off that beach. Almost makes me not want to wadefish that beach. Two are etched permanently in my brain, Billy Sandifer's huge Tiger, 14' plus in length hoisted up on a special telephone pole in Corpus. Along with a 10' plus mako caught by a youngster at the time known as Oz, the most impressive set of teeth of any shark is on those mako's. One of the bummers of modern picture taking is, no paper photograph only a digital copy. I've lost countless fish pictures when my last desktop crashed. Even took it to pc specialist to recover files, no go tho. My 24" rainbow trout is now just another fish tale, ha. Had a pic of him next to a tape measure for accuracy too. Thanks Robie. You da man! Makos are one of the funnest fish to catch in the ocean. They'll jump like a Marlin and go on bruising tears the opposite direction like a grouper. Also one of the few that doesn't piss out of it's skin. Unlike most sharks, they're absolutely delicious. Some people like black tips but I think they're horrible no matter how fast you bleed, gut, and pack them with ice... They just aren't that good to me. Mako though, it was awesome. I've never had the pleasure to eat some mako, tho I've heard the same thing, very good eating. I have caught blacktip and do like them. I think like with most fish/wild game it's how it prepared that makes the difference. I've seen plenty of people gobble down something that if they knew what it was would turn their nose up and refuse to eat it. Audad and Blackbuck as game animals, duck as fowl, and carp and catfish as fish are examples of the above statement. One of my ex-deckbuilding buds now fishing capt. at the coast was on Shark Week TV show catching mako shark making huge leaps out of the water. Blacktip are known to do the same thing just not as dramatically. During a saltwater tourney I had a 5-6' blacktip leap over the front of the boat we were fishing in. I managed to catch one about 3.5' long without a leader being lucky enough to hook him right in the side of the jaw. We were trying to catch upper slot reds in the surf but, had to give up on that as the sharks nailed the bait soon as it hit the water. 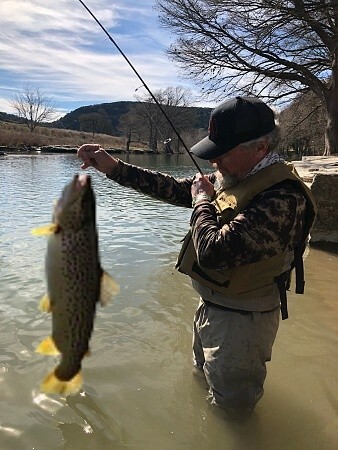 The trout over in the Guadalupe are still biting. Went back to the same spot as last time and I swear I caught that same brown trout, let him go again as he's a tad under size limit. 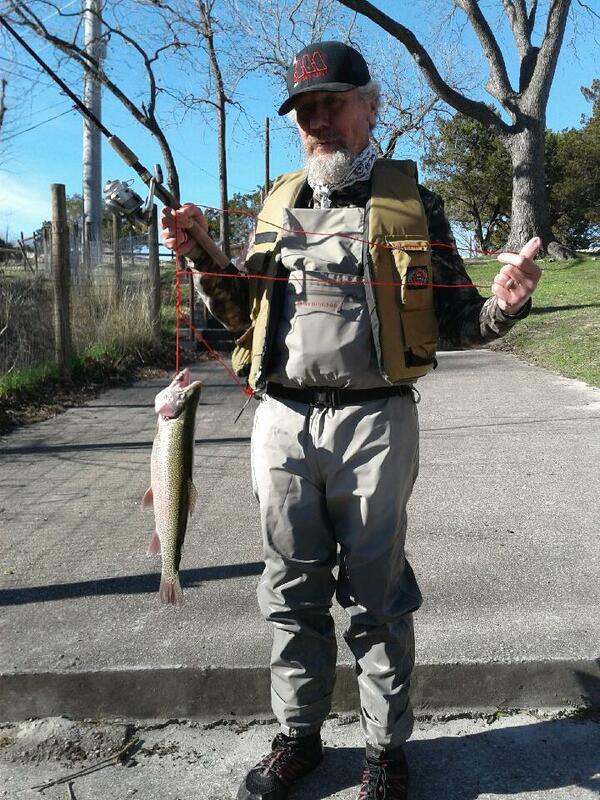 Caught a couple of smaller rainbows then went back to the launch site's big hole. Hooked into what would have been a keeper holdover rainbow but he shook off as I was trying to land him. No grilled trout tonight but, still an enjoyable trip. Worst day of fishing is better than the best day of working. Doesn't sound like a worst day either... Thanks for the update. Any day fishing is a good day. Probably should get over to Basspro for a new lure and or replacement hooks. Fish shaking off means dull hooks. Yeah, that's always my excuse. It was the best excuse I could think of at the moment. Catching any whites off your dock yet TxElectrician? 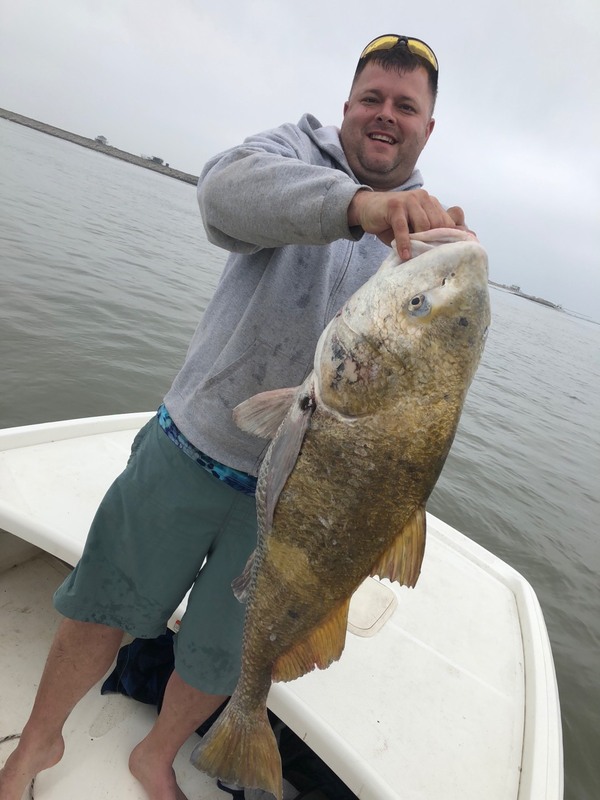 I saw a three man limit of them out of an east texas lake posted on a fishing site I frequent. I figure the run there should start pretty much the same time as Lake Medina. My dock is still not repaired from the flood. Starting to get a little pissed at my dock guy. Talked to him last week and said I needed it by first of March. We'll see. I bet that man is gonna get a donkey bbq if that dock isn't done soon. Only 18 days to go. He's been working my dock for 18 years. We're pretty good friends and work quite a few projects together. He was johnny on the spot as far as securing the dock so it wouldn't go downstream and got me out of a bind right after the storm. Told him I was in no rush to get it completed. I know he has been busy repairing a lot of small community water plants but now that fishing season is here I consider my dock a priority! Nice to have someone looking out for your dock at those times. SNL lost a nice one in the big flood here 2 years ago. Several thousand dollars just washed away never to be seen again. He did not have it secured well enough, costly lesson. Last edited by deckman22; 02-10-2019 at 09:26 PM. Told him I was in no rush to get it completed. That right there is your problem, whenever someone tells me that I straight up tell them that's a bad idea lol. I usually try and get a date when they are hoping to get something completed, and work back from there, otherwise it'll just keep getting pushed back. 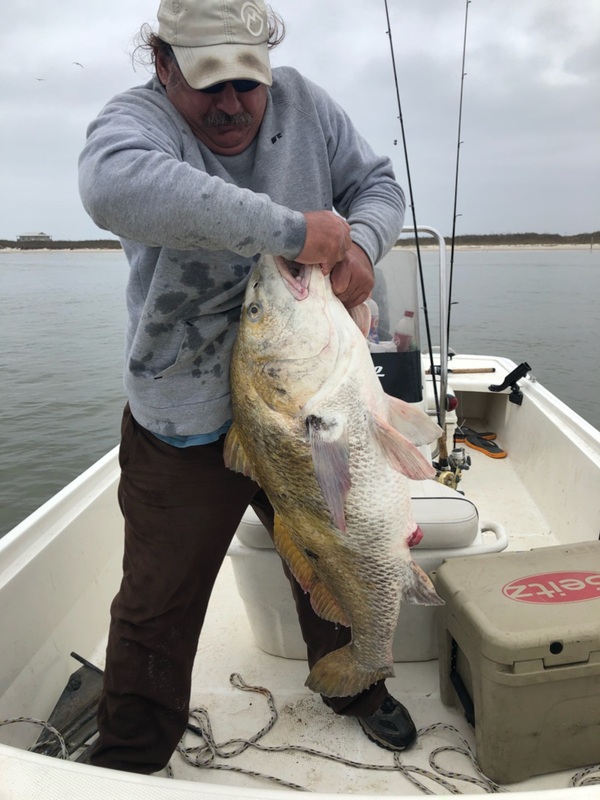 My fishing partners got into the big uglies at POC jetties. I struck out cause I chose not to go.